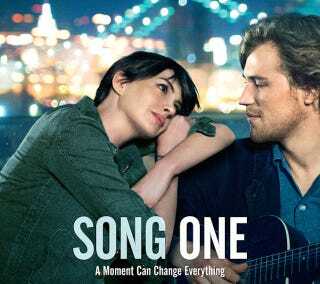 Anne Hathaway plays an anthropologist named Franny in the indie love story Song One, the trailer for which features romance, guitar-playing, laughing, crying and Brooklyn. In between hospital visits, Franny sets out to explore her brother's favorite New York City haunts, including a concert hall where his idol, singer-songwriter James Forrester (Johnny Flynn), is playing. A relationship soon blossoms between Franny and James, set against the backdrop of the Brooklyn music scene, and scored with James' folk-rock tunes. "It was really nice to weave my memories of being in those places, like Pete's Candy Store and the Bowery Ballroom, into the backstory for the character and my understanding of what the place is like." Song One is director Kate Barker-Froyland's first feature film and hits theaters on January 23, 2015.